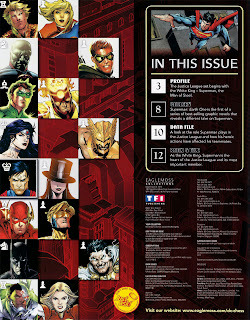 Newsarama has a preview up of next week's Justice League of America #7.3: Shadow Thief. My desire for a lack of spoilers, coupled with the fact that Newarama's previews don't launch correctly for me on this computer, means I have not checked it out -- but don't let me stop you! The book is written by Tom DeFalco (which makes sense, as he created this new Shadow Thief), with art by Chad Hardin. Should be interesting to see how much (or how little) DeFalco ties the Thief to the Forever Evil event, as she has not been seen with the Secret Society in any capacity at this point. So, who's picking this issue up? As you may have heard, Forever Evil #1 featured the Crime Syndicate of Earth-3 gathering together the Secret Society after the defeat of the Justice Leagues. This gives David Finch a chance to cram a bunch of characters onto a gatefold 4 page spread. Which means its time to play "Spot The Bad Guys!" There's a trio of Hawkman baddies in this issue. 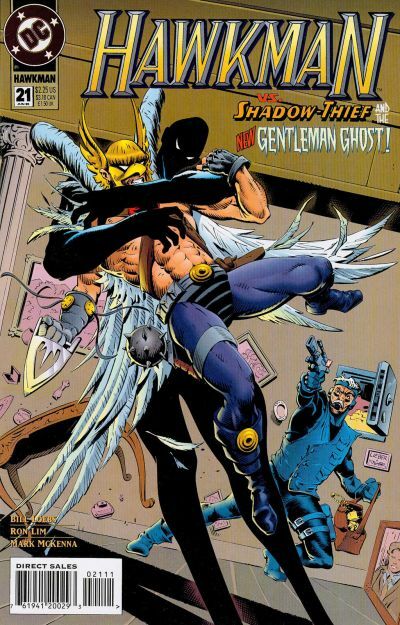 In the image above, we can see the New 52 version of the Gentleman Ghost, sporting his Philip Tan redesign as seen in the pages of The Savage Hawkman. Of course, as the only person who liked that book, I have to wonder how Craddock made it back into this plane of existence after he was banished. Pretty sure that is not going to be addressed. In front of him, the furry guy has been identified as Lion-Mane, which would make sense given his proximity to the Ghost. Oddly, Lion-Mane did not appear in Savage Hawkman , but according to Wikipedia, the New 52 version popped up in a couple of issues of Batwing, which I may have to pick up. The third Hawkfoe is The Monocle, who has a... spotlight scene, let's say. If you picked up the issue, you know what I mean. Personally, I dug the heck out of Forever Evil #1, and can't wait for the next issue. Hopefully we'll get more Hawkman enemies as well! 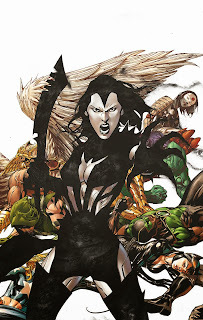 Image: Detail from Forever Evil #1, 2013, David Finch. Popped into my LCS this week in order to pick Collider #2, after discovering that the name had been changed to Federal Bureau of Physics, which is just plain strange. That not withstanding, I also perused their 50% off table, now more reasonably appointed with short boxes full of trades instead of the previous "piles of crap" look. Besides digging up 6 volumes of Sandman (leaving me with only 2 more for the full run... woo, the 90s! ), I also found this little gem! 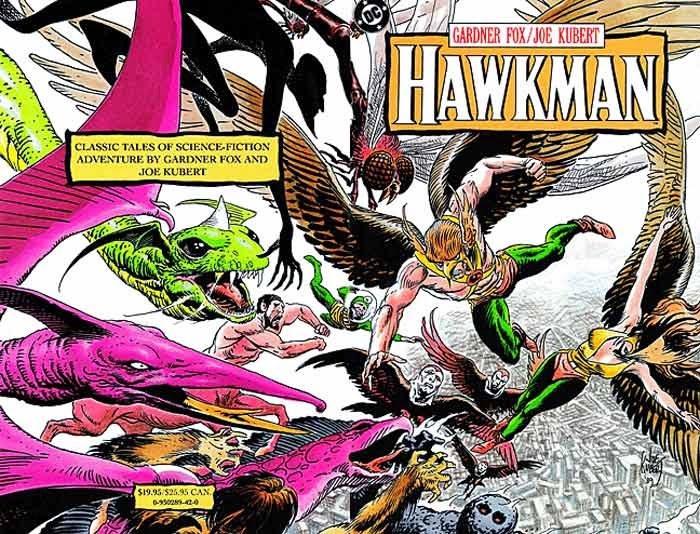 Featuring 6 issues of The Brave And The Bold, this volume collects Joe Kubert's work on Hawkman in the Silver Age, all of which are written by Gardner Fox. Of course, I have all of these issues in collected form already (in the, ahem, essential Showcase Presents: Hawkman v.1), but for a measly $10, getting these stories in color was a must-buy for me. These early tales, besides being downright gorgeous of course, set the stage for the Silver Age Hawkman. We also get the debut of the Shadow-Thief and Matter Master, plus classics like "Earth's Impossible Day" and "The Creature of 1000 Shapes!" No way to pass this one up. Image: Hawkman trade paperback, 1989, Joe Kubert. So what do you think about this upcoming spotlight on Shadow Thief, or on Villains Month in general? Images: Justice League of America #7.3: Shadow Thief preview pages, 2013, Chad Hardin. Justice League of America to End Spring 2014, Move To Canada! So, among all of the debate regarding Ben Affleck playing Batman, this little tidbit snuck out of FanExpo Toronto -- Justice League of America is ending in the Spring of next year, and will be replaced by the Jeff Lemire written Justice League of Canada. Uh... huh. It's right here on Newsarama. No word on what will be happening with the existing cast, so I don't know if Hawkman will be sticking around north of the border or not. I can say that without a shirt on, he might get a little cold, since it is unclear if the Nth Metal would still keep him warm like it did pre-New 52. Granted, they are creating at least one brand new Canadian hero for the series, as well as bringing one lost hero into the New 52 for the first time - now as a Canadian - Adam Strange. Adam Strange! Now that I can get behind! Making him Canadian is no big deal in my book -- we all know that Adam's "real" home is Rann, so swapping his nationality is not a big deal to me. I am just happy to see him make a come back. Under Lemire, I imagine that the space hero will get a chance to shine, as he seems to have a knack for tertiary characters as we have seen in Justice League Dark. So what do you think of this news? Intrigued, baffled, or maybe a little of both? Well, folks, I told you that you know a blogger is lying when they promise to post more. In my lame defense, there has not been much to be excited for in regards to Hawkman lately. Yes, the Winged Wonder has been a part of the Justice League of America title, but unfortunately his "part" has been quite small. Johns has chosen to focus on other characters -- including Catwoman, Martian Manhunter, Amanda Waller, Steve Trevor, Stargirl, and Vibe -- over Hawkman, meaning that his position in the title is mostly relegated to backgrounds, fight scenes, and the occasional macho one-liner. (Strangely enough this also applies to Katana.) So while I am enjoying the book -- and the Trinity War story -- there has not been a whole lot to really blog about. This provides me with both positive feelings and negative feelings. The positive is that all of Savage Hawkman is going to be collected. I liked this run of the title, personally, so I am happy to see DC put it all together. Maybe these stories will find more of an audience in a collected format than they did as single issues. Joe Bennett still remains one of my favorite Hawk artists ever, and his entire run in one volume will be very pretty. And with her spotlight issue coming out next month, it is nice to see the new Shadow-Thief's debut reprinted in the collection. And that's a good page count for the price, a full 13 issues for $20 (before discount). But the negative flows right from that price point as well. It's pretty plain to me that DC is dumping this out with a low price point just to get the material collected and try to squeeze something out of it. Price this at $25 and it's an automatic pass for most readers; putting it at the $20 price point and maybe you'll get a few impulse purchases and get some sort of profit off of this material. Material which I devoured eagerly when it was published and hyped and boosted as best I could. That's a depressing thought. But it's the reality of Hawkman as a solo star right now. So, instead of being brought down by that, I continue apace, ready to crack more Golden and Silver Age Hawkman comics for my reading and (hopefully) blogging pleasure. And hopefully someone out there who is curious about the Pinioned Powerhouse will pick this volume up and decide, hey, there's something to this Hawkman guy after all. Just One Of The Guys: Way Of The Warrior Part 3! It's the third and final installment of my guest spots on Shawn Engel's always enjoyable Green Lantern podcast, Just One Of The Guys! This time out we talk about the final part of the epic, space-faring machismo festival that was "Way Of The Warrior!" Plus we take a look at an issue of Green Lantern which is in the middle of a crossover, but is mostly an issue of The Brave And The Bold with Kyle Rayner and Supergirl! You can find the previous parts here and here, then click right here to listen to the third and final installment! Check it out! 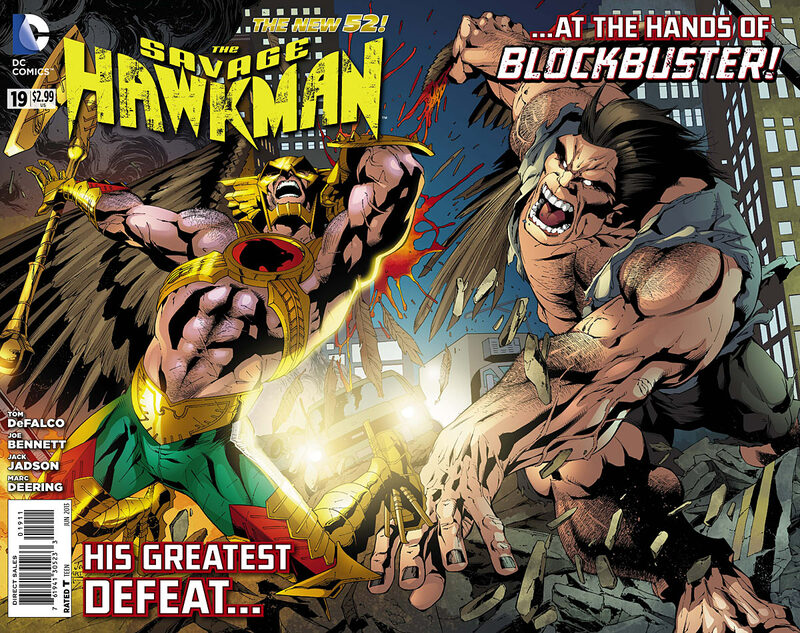 Unfortunately, today marks the release of the final issue of The Savage Hawkman, ending the series with issue #20. It's been a wild ride over the last couple of years, with 21 issues running the gauntlet from intense to confusing and everywhere in between. We've had alien DNA monsters, a shape-shifting vamp, a mysterious mad scientist, evil ghosts, an army of zombies, a youthful guest star, a vengeful ex-lover, a goatee-less Green Arrow, a one-eyed tough guy, an assassin decked out in red and black, a fanatical zealot, an alien arms dealer, a shadow-drenched anti-hero, and a musclebound brute, all seen through the raptor like eyes of our hero. I doubt we will ever see most of these concepts of characters ever again, so let this Hawkfan say "au gratin" to this book and it's cast of characters, abandoned plotlines and all. Will Hawkman soar to new heights once again? Who can say? For now we'll have to content ourselves with his appearances over in Justice League of America and hope for a return to greatness. Plus all those back issues out there waiting patiently in their bags and boards and dusty longboxes. Big thanks go out to all of the creators who have worked on the book, including Tony Daniel, Philip Tan, Rob Liefeld, Joe Bennett, Frank Tieri, Tom DeFalco, and all of the rest of the creative folks who made this book a "must read" for me month in and month out. Just One Of The Guys: Way Of The Warrior Part 2! Aw right, more of me talking nerd stuff on the Internet! I hope you guys all enjoyed the previous episode with Shawn and I, because it's time to listen to the next 3 parts of the "Way Of The Warrior" story over on Just One Of The Guys! PLUS Green Lantern Kyle Rayner and a makeshift Justice League throws down with Hal Jordan AKA Paralax! Grab the episode right here, then put on some headphones and dig right in. Get to downloading, folks -- this is one podcast you don't want to miss out on! As the title indicates, we have a new poll here on Being Carter Hall. 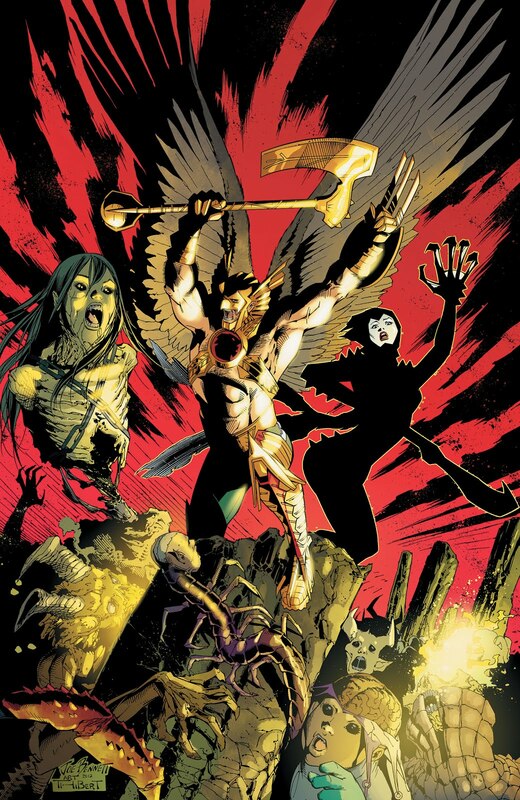 With the end of Savage Hawkman coming quickly at the end of this month, the only place we will be able to see the Winged Wonder in new adventures is in the pages of Justice League of America. I'm buying the book, but are you? And if you are buying it, are you getting it just for Hawkman, or is his presence just icing on the proverbial 4 Color cake? Click through and vote, folks! I am curious as to the results to this one! Just One Of The Guys: Way Of The Warrior Part 1! One of the side effects of running this blog is that I have also gotten much more exposure to the world of comic book and other nerd-relating podcasting. One such endeavor is Just One Of The Guys, a Green Lantern podcast focusing on Kyle Rayner and Guy Gardner, which is produced by my friend Shawn Engel. Shawn was kind enough to offer me a guest spot on his show as he covered the "Way Of The Warrior" storyline, which crossed over from Guy Gardner: Warrior to Justice League America to Hawkman! And of course that means I also got to talk about the Green Lantern issues as well! So click right here and check out Shawn and I dishing it old school about some 90's DC comics! 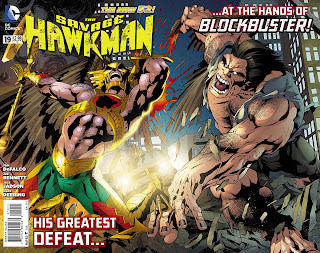 Savage Hawkman #19 On Sale Now! Hey everyone, I know it's fun to goof off on the Internet, but Savage Hawkman #19 is on sale are YOUR local comic shop right now! It's "WTF" time as Hawkman takes on Blockbuster! By DeFalco, Bennet, Thibert, and the rest of the crew, this one promises to be a knock down drag out. Blockbuster looks a little like a mix of is old self and Simon Stagg's manservant Java, but he should look fantastic fighting against the Winged Wonder in this book. You can check out a preview right here! This is the final issue before the blowoff in #20, so check it out! Image: The Savage Hawkman #19, 2013, Joe Bennet. Hawkman Hostess Ad: "She's No Angel"
Inspired by a recent episode of The Fire And Water Podcast, please allow me to present a classic Hostess advertisement featuring Hawkman! While on patrol, the Winged Wonder is waylaid by a pair of trained falcons, who plan to keep Hawkman busy while their mistress, Golden Raven, steals a golden bird statue. 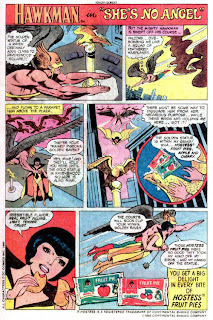 But Hawkman's quick use of some Hostess Fruit Pies distracts the dastardly femme fatale from her criminal enterprise, allowing Hawkman to take her into custody. Seriously though, this one is really a lot of fun, as Hawkman gets a Hostess Supervillain of his very own to fight. Golden Raven has a pretty good look, with her cloak and flared shoulderpads, plus the Jean Loring haircut. (One imagines that he has at least one pillbox hat in her closet.) I also like the little touch of Hawkman using his chain mace as handcuffs to keep her wrists bound, a nice touch. 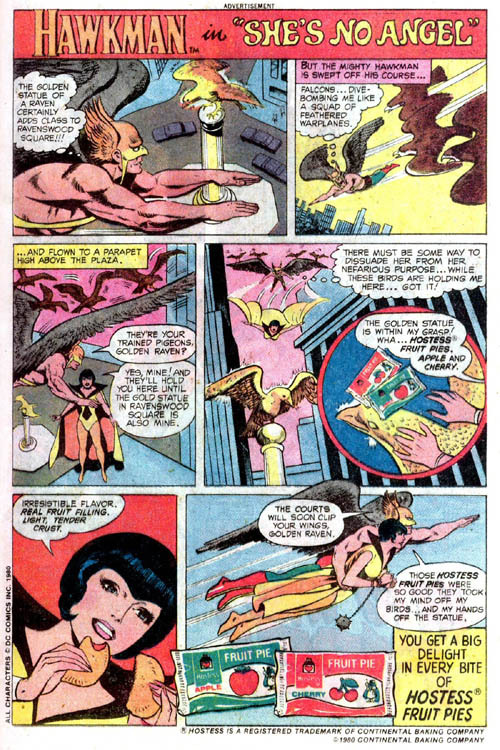 Although, I have to wonder about Golden Raven's plan -- sending birds to harass the Silver Age Hawkman, who could talk to birds, seems like bad planning on her part. I fully expect Geoff Johns to use Golden Raven in the pages of Justice League of America. According to Rob Kelly (of The Aquaman Shrine! ), a lot of the art on these was done by Curt Swan and Vince Coletta, which I am willing to accept. Swan did not work on Hawkman much so he doesn't have a very clear "defined style" on the character like, say, Murphy Anderson did. Image: Hawkman Hostess ad, artist and date unknown, retrieved from ComicVine. You know, there's been a lot (and I mean a LOT) of negative reviews on the Internet for the entire run of Savage Hawkman. I personally don't understand the animosity amongst the netmarks, nor where the "let's get this book cancelled!" campaigns have their origins. And I'll also admit that there have been some less than stellar issues of the series. But this, my friends, takes the proverbial cake. I'm not sure how else to put it, but, man, Hawkman v.3:no.21 is without a doubt the single worst issue of Hawkman I have read across any iteration in any era. The story involves Hawkman attending a giant Conservative bash in Chicago (why would Conservatives ever party in CHICAGO?!) only to find the entire place to be crawling with scum and villainy. Oh boy, where to start with this mess? The story is a train wreck. Never mind the grasping, heavy-handed, groan-inducing politics of Bill Loebs (any time a Liberal tries to write a Conservative, it comes off childish and immature... much like a Liberal), but even beyond that the story makes no real sense. We are introduced to a "new" Gentleman Ghost... who happens to be named "Gentleman" Jim Craddock. Only he's not a ghost, he's a high society jewel thief who makes the same joke about his thieving habits being rumor and allegation literally in every scene he appears in. EVERY SCENE. Wow. This version of the Ghost was so popular that he appeared exactly one more time, in Underworld Unleashed #1 of all places, before being thankfully consigned to the fading memories of those unfortunate enough to read this comic. To say that Loebs misses the point of the Gentleman Ghost would be a disservice to other writers who have missed points over the years. The Shadow-Thief does not fare much better. Bemoaning the guests at the party, Sands mutters "This country gets whatever it deserves." Really? Carl Sands is suddenly a bleeding heart who cares one way or the other about the elected officials of the country? Carl Sands, serial burglar who is obsessed with power cares about who won the midterm elections? The stupidity continues when Hawkman stops him by touching part of his shadow-costume and then claiming that the suit was obviously built with a failsafe... that he simply did not use until this very moment, which is lucky, since the issue was almost out of pages. Urrgh. I won't get into Katar spouting false statistics straight from Mother Jones (if this issue was written today you could change this reference to "the Huffington Post," and it still works), nor the fact that Helene Aster is involved with this story, despite being a reincarnation of the ancient Egyptian Hath-Set, and our hero being from Thanagar. The art is from the normally reliable Ron Lim, but this was clearly a phoned-in paycheck for him. I can think of no other rationale for Katar's horrid party attire, or why the Shadow-Thief is suddenly an elf. He does pull a nice trick -- the design of this, ahem, "new" Gentleman Ghost is about as boring as the character himself, so that is something. The rushed aspect continues if you examine a few details. The cover date is June 1995, which means this hit the stands in March, a few months after the 1994 midterms. At the time of the midterms, the book was hip deep in the "Eyes Of The Hawk" storyline, in which Loebs was setting up his new status quo for Hawkman. So, it seems to me that he wrote this drivel after the elections, had Lim handle the art because Steve Lieber was still doing the regular book, and then released it when they had a chance. Apparently the Contract With America was an excuse to write really piss poor comics. I sure hope that "Way Of The Warrior" is better than this, because I cannot imagine it being any worse. Image: Hawkman v.3:no.21, Steve Leiber, 1995. Had a chance to read the new issue last week, and wanted to mull over it for a few days before posting. This issue, once again, feels like a throwback to the late 1980s or early 1990s. The dialogue, the thought balloons, the plot, all of it feels like a relic from that era. I am unsure how to feel about this. 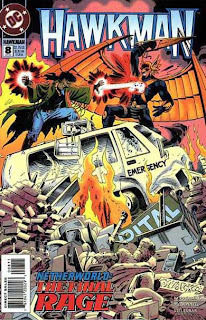 In one sense, I started reading comics in the early 90s, and have a lot of love for that "Post Crisis" period in both the DC and Marvel universes. So a book which espouses that sort of straight forward mix of action and character hits the mark for me in a way that a lot of what I call Modernist comic books simply don't. It's that "Golden Age Period" theory, where your personal Golden Age of Comics is when you were 12. 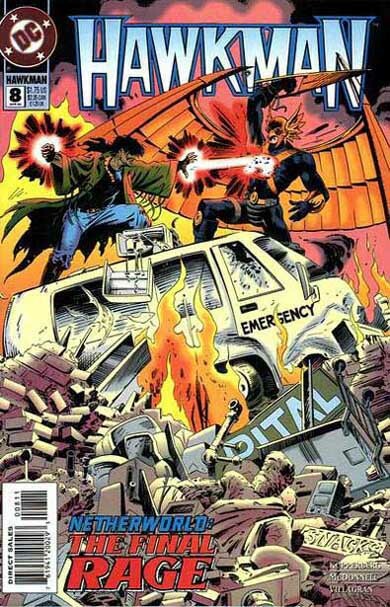 But all that said, should a comic book published in 2013 really sound like it was written in 1990? I mean, should it really? And does that even matter? I liked the comic, actually. Our new Shadow-Thief is a big change from Carl Sands, and her stance as a sort of gun for hire is a nice touch. The next (and final) storyline is set up in the subplots, and we do get some nice action with Hawkman and Thief against the beasts of the other dimension. But there is some oddities. For instance: After Hawkman calls her Shadow-Thief, why does our new Thief never correct him or demand to be called something else? Isn't it convenient where Prof. Ziegler is taken for treatment just happens to have a deep dark secret? Are we really introducing a bad guy named Dr. Payne? And why is everyone SO ANGRY?! Also, DeFalco gives us a new wrinkle in Katar's backstory -- battling in gladiatorial pits before being noticed by the King and brought to live in castle, where he was exposed to the cruelty of the ruling class, and presumable became the "brother" of Corsar and the consort of Shayera. (How very Robert E. Howard.) This continues the new twist on this which DeFalco introduced in the previous issue, and frankly, I like it a lot more than the almost pacifistic Katar we saw from Liefeld. It also fits much better with how he is being portrayed in Justice League of America -- which is to say, a brute -- and jives with the "Savage" part of the title. The art is switched up a little bit this time. The scenes which take place in the "real world" are by the usual team of Bennett and Thibert, but those in the Shadow Realm are done by Fabrizio Fiorentino, nicely differentiating between the two areas. I can't say I am surprised that the book is ending in a couple of issues. But for whatever the opinion of one blogger is worth, I'm still having fun. Image: The Savage Hawkman #18, 2013, Joe Bennett. In my efforts to get caught up to "Way Of The Warrior" I have been of course reading Volume 3 of Hawkman, and after the exit of John Ostrander, I am now hip deep in the work of William Messener-Loebs. After the first story arc, "Godspawn," and then the Zero Issue, which establish the new, merged Hawkman character, our hero moves into the "Eyes Of The Hawk" arc, wherein he battles various other Avatars of animal spirits. The second part of this story, in issue #15, is entitled "Among The Minnow" and features, among other things, a throwdown between Hawkman and Aquaman. This issue is better known for the fact that it turns the Aquaman baddie Scavenger into a child molester and murderer. Yikes. But the battle between the two heroes was a timely piece of reading considering the current debate about the two characters spinning out of Justice League of America #1. So it got me thinking about the two characters and how they would match up in the New 52 universe. Most of the chatter which I have heard online tends to lean strongly towards Aquaman, with Newsarama calling the match up a "stretch," and others vocally questioning how Hawkman could hang with Aquaman. This amuses me greatly because had this question been asked 10 years ago, the net marks would have been leaning the other way. I guarantee it. In 2003, Hawkman was one of Geoff Johns' darling characters, and Aquaman was still seen as an aimless joke of a character who did not deserve to have his own title. Fast forward to today, and it's the opposite situation. So I don't put much stock in that. In 2003, I liked both Hawkman AND Aquaman. And that's still true today. So I don't really think I am influenced one way or another in sizing up these characters in terms of a fight. Both characters have their strengths and weaknesses in a straight up brawl. Both have an enhanced level of endurance, and they can trade blows back and forth. Aquaman has finally gotten the respect he deserves for how powerful he can be on land, and Hawkman has been put over as a powerhouse for a while now. Both have also been consistently portrayed lately as skilled warriors with weapons -- trident and mace, respectively. Aquaman obviously has the edge in the water, and Hawkman clearly owns the skies. So that's a wash. Both have also been shown to have a bad temper, and give into their warrior's rage, as well. A battle between these two would be an epic, back and forth, down and dirty, knock down, drag out smash-em-up, in the mud and dirt. This is not the kind of fight like Superman and the Martian Manhunter, where they'd be throwing continents at each other. This is much more grounded and harsh. Given the crew on the team, Hawkman is the only one who can match up with Aquaman, and it makes perfect sense for Waller to put him in that slot. So who would win? Honestly, I think it's a stalemate. Neither would ever give quarter, and neither would ever ask for any. At the end of the day, it would come down to how the rest of the battle goes. Because if Superman takes out the Manhunter, and the Justice League has the JLA on the ropes, Hawkman would eventually get taken down by the others. Same if the JLA had the upper hand. But one on one, sorry but that's too close to call. But one thing is certain -- it would be a clash for the ages, that's for sure. This is more of a milestone for me than it appears at first blush, as this actually finishes off my punchlist for Volume 3 of Hawkman. At this point I am only missing a handful of Silver Age and forward Hawkman issues in either singles or collected editions, and these two had eluded me for quite a while, for some reason. I found the Guy Gardner issues easily enough, but these were MIA when it came to the bins I scoured at various shows over the years. I'm hip-deep in the first Messener-Loebs story, which definitely has a very different vibe (but not Vibe) than the Ostrander stuff. It's intriguing. But that's a post for another day. I'm working my way through Volume 3, in prep for "Way Of The Warrior," so here we are with the two parter "King Of The Netherworld." And Mongrel is back. Yay. Back when I read the Hawkman Annual #1, I mused that I wanted someone who had actually lived a hard life to put Mongrel in his place. Well, I don't know that Katar Hol has lived as hard a life as some other heroes, but he puts Mongrel in his place pretty good in this two part story which clears the deck of some aspects of the Ostrander stories and sets the stage for Bill Messener-Loebs to come in during the Zero Hour build-up. Our story is as such: Mongrel, still angry at the entire world, goes to the Netherworld, where he tells (read: shouts) his intentions to lead the Netherworlders and get them a bigger piece of the pie. Most of them aren't interested, prefering their independence, but enough follow Mongrel to form factions amongst them, and brawls begin to break out between the sides. After Naomi sees a vision of Netherworld being attacked by a giant dog (subtle...), Hawkman interjects. The battle escalates until Mustang Suzy is critically wounded, and dies at the hospital. Mongrel attacks Katar in the hospital, and a few of his loyal metas steal a cache of drugs from the pharmacy. As Mongrel and Hawkman duke it out, Mongrel's goons pass out the drugs, which they do not realize are tainted with a bacteria which is harmless to humans, but lethal to metas. As the Netherworlders begin to drop like flies, Mongrel bemoans that this was not what he wanted and blasts away, leaving Hawkman to pick up the pieces of the decimated Netherworld. Scribe Paul Kupperberg has a pretty inenviable task, trying to present the thoroughly unlikeable Mongrel as a character who waivers between sympathic and scummy. His actions in this story pretty solidly cement him as "scummy" in my book, including essentially starting a bloody civil war amongst the Netherworlders, and then complaining that it was not his intention, or demanding that others follow him just because he says so. He says things like this often while physically attacking others, including nearly destroying a hospital full of patients. Kupperberg does a good job, however, in demonstrating how Mongrel's attitude effects others. Shayera, for instance, calls him no better than a mad dog who needs to be put down. Katar starts out feeling that Mongrel has the potential to be a good person but has been alone with his anger too long -- but eventually, Katar comes around to Shayera's thoughts, calling him a little wannabe dictator as Mongrel performs one careless act of violence after another. Mongrel himself has a few moments of clarity, but they are too few and too far between. He's a lousy character to try and push as an anti-hero. He makes for a good (if whiney) villain in these two issues and he should have stuck to that route. On the art, Luke McDonell and Ricardo Villgran are a good pairing, but I still miss Jan Duursema. This is a personal bias, though, as I thought the crew did a fine job, especially with all of the strange Netherworlders. Mustang Suzy, for example, looks fantastic, a true merging of metal and flesh. The covers to both #7 and 8 are by Steve Lieber and Rick Magyar. #7 is nice as well other than the fact that Mongrel is the main character and Hawkman the secondary one. The cover copy includes the blurb "Mongrel Rules!" which makes me wonder if DC thought Mongrel would catch on the way that Carnage did over at Marvel. The cover to #8 is very nice, as Hawkman and Mongrel battle it out amongst the rubble at the hospital. All in all I did enjoy the story even though it was a "clear off the table" sort of tale. I liked seeing Mongrel get taken down (even if he managed to slink away) and I liked Hawkman's coming around to the realization that this kid is a problem and not a victim. There's a lot of good action, and dropping the Netherworld stuff is probably for the best as it has been more of a distraction than a focus in this volume so far. Not the greatest issues in the world but considering the bad guy and the intention of the story this could have been a lot worse. That sounds like faint praise, I but I dug both issues. Image: Hawkman v.3:no.8, 1994, Steve Lieber. Coming: "Way Of The Warrior"
Just picked up off of eBay: Justice League America #101-102, which are the final parts I am missing for the "Way Of The Warrior" storyline which started in Guy Gardner: Warrior, and of course Volume 3 of Hawkman. My friend Shawn Engel runs the Guy Gardner and Kyle Rayner podcast Just One Of The Guys -- and if you are not listening to it, you really should be -- and he's just hit Zero Hour, which means that "Way Of The Warrior" will be coming soon enough. I've never read this far in Volume 3, but once I get caught up on Earth 2, I am going to start making my way through the series. I heartily recommend Shawn's Just One Of The Guys podcast to anyone interested who came up in the 90s and has fond memories of that period. Go check it out! 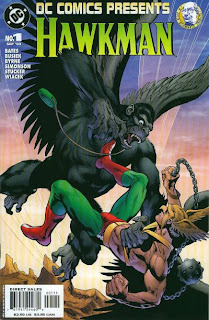 I read Hawkman v.1:no.6, "The World Where Evolution Ran Wild!" last week, and when I did, I was instantly reminded of this great cover of DC Comics Presents: Hawkman by Jose Luis Garcia-Lopez (praise be his name, h/t to The Fire & Water Podcast). What's better than gorillas? Why, FLYING GORILLAS of course! This is the DC Universe, after all! Image: DC Comics Presents: Hawkman #1, Jose Luis Gracia-Lopez, 2004. I have been trying to go through my ridiculous backlog of toys and get them opened up and displayed lately. I am still catching up (a new GI Joe movie will always get me backed up with new purchases), but I have managed to bust out two new Hawkman toys, one actually new and one only new-to-me. So here's some quick thoughts. The New: DC Comics Unlimited "Savage" Hawkman. This large figure is in the style of the DCUC Hawkman in terms of sculpt and articulation. Otherwise, it is all Philip Tan's design from the New 52 launch, right down to the weapons. It's a well proportion and detailed figure, with nicely buff arms, a typically barrel chest, and impressive wings. The wings use the same sort of hinge piece as the DCUC figure, which makes sense, but is still ugly. Still, how often are you going to look at him from behind? He retains a grimace, which fits for the Tan depiction of the character as well. The axe weapon is a nice change of pace from the maces which Hawkman is normally given. The shield/claws piece satisfies the shield requirement nicely. Overall, I really like him, but beware that the cost of these 6" figures has gone up to almost $18 to as much as Twenty-Five Dollars in some places, so caveat emptor. I thought he was worth it but your mileage may vary. The New-To-Me: Mattel Total Justice Hawkman. My friend Frank has a strange sort of love the Total Justice line, and in a way I do as well. As a y'ung'un I only had the Flash, who was very prone to falling over, but in general I think the line did alright considering the gimmick and the era in which they were produced. Hawkman has the benefit of what Transformers fans call "third leg mode," and-- get your mind out of the gutter. His wings are mostly static but the right wing tip is close enough to the ground that it can act as a tripod for the figure, helping him stand sturdily. The details which are there are pretty nice -- I like the long hair sticking out from below the helmet, for instance. The armor pieces are a waste of time, as usual, but the figure itself is a nice enough rendition of Katar Hol, and I can easily see a kid playing with him along with the other members of the Justice League. The final verdict is that I still love Hawkman toys. Two excellent additions for my Hawkman shelf and a nice whetting of my appetite for the two big 2-packs I still have sitting unopened -- the DCUC Hawkgirl vs Gentleman Ghost set, and the DC Direct Hawkman and Hawkgirl set. So we'll save those for another time. It seems that Geoff Johns is spinning our Space Cop into mysterious and deadly territory. His encounter with Byth (or I should say "Byth") is something which either previous version of Katar Hol would never do. He'd bash the perp's head in with a mace, sure, but the combination of the detached, clinically cold attitude and a seeming lack of concern for the law are whole cloth additions to his personality -- both pre-New 52 and in the present. This goes beyond Space Cop. We're even moving past Space Dirty Harry Callahan (remember that in Magnum Force, Callahan said that the law may not be perfect but it's the one they have and until there's a better way, he will enforce the law) and into new territory here. How does this resolve with Savage Hawkman? Who knows? Considering that the solo book ends in 3 issues, I'm sure a lot of readers are asking "Who cares?" instead. It's clear to me that Johns is making Hawkman as much a mystery as anything else in this book. I may be more prone but he hooked me in this issue. Now it's time to deliver on the potential and knock this book (and Hawkman's depcition therein) out of the park. My box from DCBS arrived today, so while there was a few spare moments, I sat down with Savage Hawkman #17 and gave it a read. This issue almost feels like a throwback to a comic from the post-Crisis on Infinite Earths era of the DCU but with a modern look. Which is appropriate as the writer is Tom DeFalco, who certainly penned a lot of stuff in the 80s. I like DeFalco and I like the 80s, but this is a little jarring from what we have gotten on this series before. There is no Carter Hall! He is pure fiction. A convenient guise constructed while my memory was impaired. I am Katar Hol. A warrior who revels in the power of the Nth Metal -- not a cowering academic who fears it! I am a hunter of men and monsters -- sworn to protect my adopted word from all threats terrestrial and galactic. Now, as an answer to the question "Who is the New 52 Hawkman?" this is fabulous. We should have gotten something along these lines in the first issue (h/t Count Drunkula). It might be a bit melodramatic but it's concise and direct. That's the new Hawkman in one page of thought bubbles. But... and there is always a but... how does this jive with what we saw before? #0 showed us a Katar Hol who was more lover than fighter. Was there a warrior side to Katar which we never got a chance to see? Evidently, or at least that is the retcon. I have no qualms about a "Space Conan" as long as he is written consistently and effectively. I hope Geoff Johns intends to do just that. As for the issue itself, I liked it, even though it seems a little like going through the motions just because we all know the end is near. 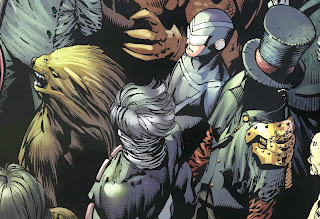 I liked the bad guys, the return of some of the supporting cast, and the new Shadow-Thief was a totally new animal from Carl Sands, which I liked. And of course the art was fantastic as usual. So while not an issue that would save the series, certainly one I had fun reading. That's all I am asking for right now. My latest box shipped from DCBS yesterday, so that means I can expect to get my mitts on Savage Hawkman #17 and Justice League of America #1 shortly. I also made a trek to Borderlands today to pick up Earth 2 #9 and #10, which I had passed on originally due to budget. Ironically, the cancellation of Savage Hawkman (along with some other books I read such as Sword of Sorcery) means that I can afford to buy Earth 2 again. As William Shatner once said, "Irony can be pretty ironic sometimes." This move is probably better in the long run, as I think Earth 2 will last longer than the 20 issues which Savage Hawkman is slated to run. But then again, I have a horrible track record at predicting this sort of thing, so eh. Right now I am digging what's going down in Earth 2 so I'll just enjoy it for as long as it lasts. How Does a Pacifist Walk The Way Of The Warrior? Sometimes I question why I do mail order. "The savings" is the correct answer, and the answer I always come back to. But it makes it very difficult to wait to read these books that everyone else is talking about, especially when it comes to Hawkman. I can't comment on Savage Hawkman #17 or Justice League of America #1 because my dang box won't ship until this week thanks to DCBS's new shipping policies. Hrrn. I want to read JLoA (prepare yourselves: I bought the South Carolina variant) specifically because of what I have been reading online about Hawkman being portrayed once more as a brutal warrior. This is in line with how Johns wrote the character in both the pre-Infinite Crisis JSA as well as in Volume 4. I just finished up the "Wings of Fury" collection from that Volume, and that was the final conclusion of the Headhunter storyline -- that Carter needed to embrace his warrior self and abandon the "masks" of civilization which he wore. Which puts us in a weird sort of position as our New 52 Hawkman is Katar Hol, adoptive Thanagarian royalty. And non-warlike adoptive Thanagarian royalty at that. How does this guy -- the guy who was the "peaceful" brother back on Thanagar -- become the warrior like Johns clearly wants to write him? I think it's plain looking at it now that Tony Daniel had one thing in mind, and then that got jettisoned when Rob Liefeld came on board. And then that itself was jettisoned when he left and now the character is back in a sort of narrative limbo. What is it about certain characters (like Hawkman) who attract this sort of wonkiness? My theory is that it is the multiple origins, and different creators having different favorites of the origins, and those favorites not playing well together. There has to be something more to why Katar has changed his mind about violence and the way of the warrior. I have a gut feeling that Johns intends to address it as he has shown a prediliction towards that characterization in the past. We'll see soon enough, I imagine. At least those of us who don't have to wait for our mail order boxes. There's an old joke that you know a salesman is lying when his lips are moving. There's a newer joke that you know a blogger is lying when they say they will post more often. Running a blog is the definition of a labor of love. You're certainly not getting paid to do it, and any time you devot to it is time away from family, or work, or relaxation, or chores, or whatnot. There's little upside in terms of opportunity cost in running a blog. Yet lots of us do it -- specifically the loosely knit circle of DC Universe character specific blogs which have all sort of sprung up in the wake of Rob Kelly's Aquaman Shrine (no pun intended). We're an odd bunch of bloggers with an odd spectrum of approaches, styles, interests, and mindsets. We run the gamut from one coast to the other, one side of the aisle to the other, new school, old school, high school, grad school, and clown college. But at the end of the day we all share a love for the DC Universe and at least some subset of the characters who inhabit it and interact with each other. Yeah, get to the point Luke. Like I said this is a labor of love. And when things get turned up to 11 in other parts of your life, the labors of love inevitably suffer. It's simply the way it is. And this is no different. Working as the sole instrument engineer on a construction site is a demanding, time consuming task which will creep and creep and creep until it takes over all of your waking hours. If you let it. And while I have successfully fought that battle on other fronts, this battlefield was lost. The other night I was cleaning out my nightstand and came across two nearly completed Hawkman collections. One was the "Wings of Fury" trade for Volume 4. The other was the Golden Age Hawkman Archives. I stared at those two books for a few minutes and felt a wave of feelings. Guilt, mostly. Guilt for not keeping up the blog. Then a bit of regret. Then... inspiration. I put aside the other comics I was reading. Shogun Warriors was published several decades ago, it can wait a few more weeks. Morbius is a vampire, he's effectively immortal. Godzilla will understand. And I did something I had not done in months. I sat down and read Hawkman comics and had a grin on my face the entire time. I had stopped reading my Hawkman collection because I didn't want to take the notes and blog about it. Isn't that a stupid reason to stop reading the adventures of a character who I have come to love over the last few years? A character whom I loved enough to devote this blog to him and his partners and foes and associates? I started this blog as a chronicle of "one fan's journey into Hawk fandom." I think it is safe to say that "I have arrived" there. Being Carter Hall needs to be refocused. Repurposed. I know all about Hawkman, whichever one you want to talk about. It's not a journey into the fandom now. I am part of it. They say that writers gotta write. Well, bloggers gotta blog. And while I may not be as up-to-the-minute as I want to be with news and tips, but I feel like I need this. I need to get back to a place where I can sit down at night after the kids are asleep and the dishes are washed and the email is answered and just read comics. Read comics where a pair of winged warriors use the weapons of the past and the technology of the future to fight the crime of the present. Maybe the posts themselves won't be as structured as they were. Maybe I'll finally talk about the villains I have been promising for years. Maybe, maybe. But I know that I want to read Hawk comics and blog about Hawk comics and talk about them with all of you out there in Internet Land. So now I have to ask: Will you have that discussion with me?